What a nightmare trying to get home! I was at the airport at 9.30am for a 10.30 flight… we eventually left at about 1pm after the aircraft went technical&apos; – whatever that might mean. Of course they didn&apos;t tell us this until the last minute by which time we were in the departure lounge at Guernsey airport which has absolutely nothing to entertain anyone, except a duty free shop. So they let us all back into the main airport terminal so at least I could get something to eat! I finally arrived home at 5pm. Then I had to go and pick the cat up from the cattery. This would have been fine, except the main road there was shut due to an accident so I had to navigate my way through all the back roads. To cap my rubbishy day the cat was most unimpressed at being shoved into her basket and she proceeded to froth at the mouth, puke and then crap in her basket. It smelt utterly disgusting and I almost threw up in the car. Anyway, I am home safe and sound and everything is unpacked and the first of several loads of washing is on. I am also looking forward to getting into my double bed after sleeping a single bed for the last fortnight. I am a simple soul really! Well I have had a lovely Christmas and I am due to travel back to the mainland tomorrow although I will be back on the island in a fortnight for a family wedding. I have had a nightmare trying to pack… I always seem to have way too much stuff to take back with me, so in the end I have decided to take another bag home… wonder if I will get charged for it. Well I have had a lovely Christmas Day. Managed to drag myself to church this morning (after doing 3 services yesterday!) and ended up sitting with several of my cousins and sisters. My Mum and aunt were both singing in the worship group this morning, which generally meant lots of disapproving looks when we started misbehaving. After that the cousins and I went up to my grandparents and snuck onto their patio and sang O Little Town of Bethlehem to them. Grandpa has been really quite poorly and hasn’t been able to get out and he found it very emotional to see his grandchildren singing to him. Then we had a ginormous Christmas lunch and went for a walk across the beach and tonight we went up to my other Gran’s house. As usual it was utterly wonderful chaos and my cousins were on top form. They are all in their twenties and thirties but somehow manage to metamorphose into 10 year olds when we are together. So they were having the usual farting and burping competitions as well as the compulsory how-many-home-made-profiteroles is it possible to eat without feeling sick. We played board games and gossiped and had a wonderful time. I recognise just how privileged I am to be part of a big family who generally get on well together. I can&apos;t really imagine being anywhere else for Christmas, even though it has taken me years to truly appreciate the diversity and insanity of my family. I read loads of different people&apos;s blogs and one which I read regularly is written by a guy called Peterson Toscano. He describes himself a theatrical, performance, artist, a very queer and quirky Quaker, and an ex-gay survivor. I had the privilege of seeing him perform this year and found it an extremely moving experience, not least because I recognised the experiences of some of my friends portrayed through his drama. I really hope that he doesn&apos;t mind me linking to his blog but go and have a look at some of his thoughts. 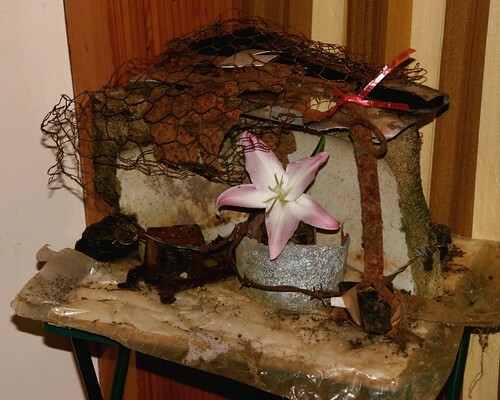 A local conservative church here in Crieff, Scotland asked members to create floral arrangements to symbolize the birth of Jesus. These could be traditional, literal representations of the stable with Jesus in the manger, or something more abstract. A friend of mine, who is a member of the church, invited me to design and construct one with him. Some days later I envisioned a stable made of rusted, broken, ugly, inorganic materials with a single sprout of new life wedged into the rubble. (The emergence of something New in the midst of the old world-order of brokenness and decay). I thought this image was beautiful and is a world away from the tat and gaudiness that we so often see of Christmas. For me it is a simple but clear representation Jesus, the Light of the World who came to bring beauty to a broken, damaged and dirty world. You can keep your Father Christmases, tinsel and over-indulgence; this is the image of Christmas I want to hold onto. One of hope in the darkness, joy in the sadness and the unsurpassed beauty and grace of the Saviour. Today is my birthday. This time last year I was having a small (well ok… a largish) crisis about turning 30. This year, however, I am feeling remarkably relaxed with the fact that I can be said to be in my early thirties. Mind you I can still be remarkably childish at times… I went out on a hen party last night and arrived home at about midnight. My parents were still awake so I was standing in their bedroom, wearing pink fluffy devil horns singing Happy Birthday to me…. Mum wouldn&apos;t let me open my presents though…. life is cruel sometimes. 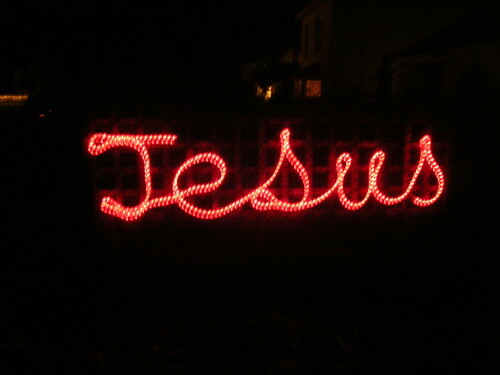 We have a flashing Jesus on our fence! Well the saga of Gran’s Christmas Tree has continued today. I had been volunteered by various members of my family to put the tree up and decorated it, but when I got there yesterday and unpacked it the stand was nowhere to be found. So I put everything away and decided to go and get a new stand. First of all we tried putting it in an old stand that it had at home, but that didn&apos;t work and after trawling practically every shop on the island my Mum and I decided that you just cannot buy stands for fake trees anymore… so… we bought a new tree! It was half price and is 7 foot with red light berries attached. It is really pretty and just has loads and loads of lovely baubles (including some really old ones) attached. There is not a single bit of tinsel because I think it is Nasty and as I was in charge of the decorating, it was my choice!! For a start they were one king short as a kid was poorly so my 28-year-old cousin got roped in to participating. As usual Jo-Jo did not disappoint. It was all going so well until he was handed the microphone and instead of saying myrrh&apos; he did a long Darth-Vader-like breath into it. At which point my cousin (his Dad) sat there shaking his head. Then followed the crib scene where Jo-Jo and his cousin proceeded to try and tear one of the lambs apart by holding an ear each and pulling tug-of-war-style. I am not sure I have ever seen my Mum so stressed. She is a teacher so Christmas is always a bit of a nightmare, but I have to say that this nativity was one of my favourites. It was so funny, and yet the kids and adults alike adored it. My Mum is a legend and I love her loads, but she is so committed to everything that she always looks knackered. 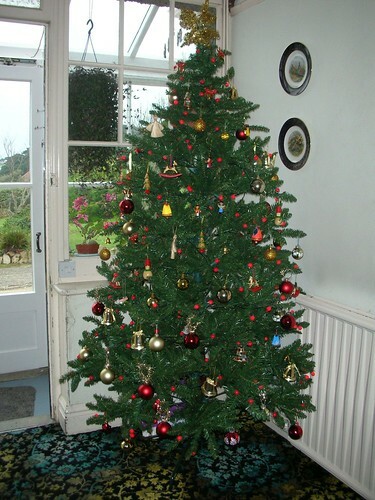 So today, I am in charge of decorating the Christmas trees whilst she is at school…. So I should go and get on with it! Well yesterday was fun. In the afternoon I went with my Mum to an event called The Road to Bethlehem&apos; which is run by one of the local churches. It is a big marquee and when you enter you start a tour of a traditional&apos; street to Bethlehem. 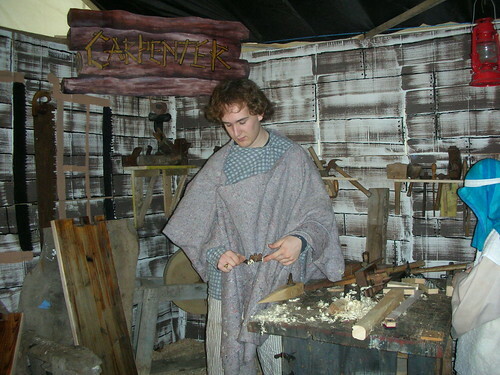 So when we walked in we went past the tent makers, carpenters, potters, weavers etc. they also had donkeys and sheep in pens and eventually you ended up at a crib seen. The various characters were all people from local churches dressed up and there were a variety or roman soldiers who were wandering around asking the children to show their passports. It was really lovely and was an interesting way of getting the Christmas story out to a wider variety of people. I think last year they had about 2000 people walk the Road to Bethlehem. 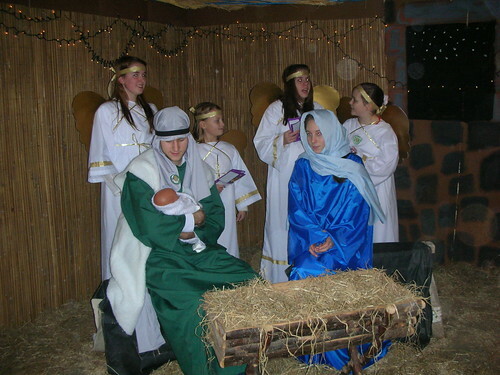 The Little Baby Jesus… not lying in a manger! 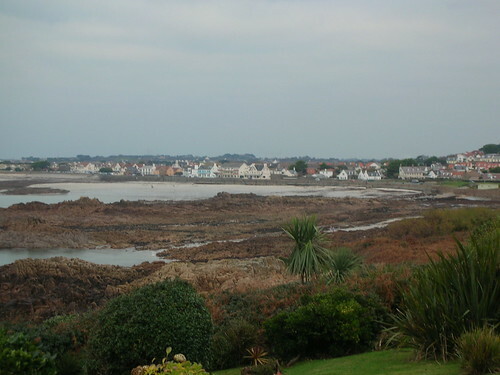 Well I finally arrived back in Guernsey. I had to get up early to take the cat to the cattery and naturally she gave me the cold shoulder. Then I had to go home, finish packing and get my backside to Gatwick airport and there I proceeded to sit and wait. All the flights were on time… except mine. Typical! So I am home safe and safe and sound, back in the ample bosom(s) of my family and it is lovely to see them all. I went to my aunts&apos; house for tea as my parents (as always when I am home for Christmas!) had a social event planned. It was quite an entertaining evening though as my uncle claims to be an expert on everything. So we had the running commentary on Strictly Come Dancing, The X-Factor and he did a Trinny and Susannah on all the clothes. He is quite amusing really! After this I took a quick trip to the beach tonight and I stood there breathing deeply – it smells very strongly of vraic (seaweed) at the moment and it was such a clear evening and the stars were wonderful. In Guernsey we have the advantage of not having many streetlights which means that the stars are really clear. These are the sights, sounds and smells of home and I miss them desperately at times.